As 2017 comes to a close, Emory celebrates the season with campus traditions that bring the holidays to life for young and old. With festive concerts and a visit from Santa himself, opportunities for joyful celebration abound on campus this December. Join the Candler School of Theology for Advent Services beginning with the Hanging of the Greens on Tuesday, Nov. 28, followed by the Magnificat: Songs and Readings service on Thursday, Nov. 30, and a service of carols on Tuesday, Dec. 5. All begin at 11:05 a.m. in the Cannon Chapel Sanctuary and can also be viewed via live streaming. Holiday gift-shopping is made easier with the Michael C. Carlos Museum Bookshop’s Two-Day Holiday Sale, Dec. 1-2. Everything in the store is discounted 20 percent, including books for adults and children on art, history, world cultures, religion, folktales and myths. With a quirky selection of jewelry, imported fair trade craft gifts, 2018 wall calendars, notecards, holiday cards, and educational gifts, you’re sure to find a treat for every loved one on your list. 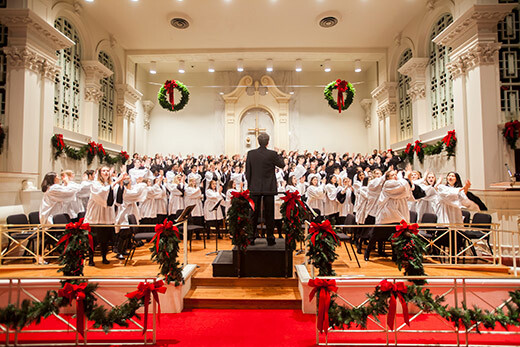 Emory’s seasonal concert traditions return with campus-favorite, A Festival of Nine Lessons and Carols, Friday, Dec. 1, at 8 p.m. and Saturday, Dec. 2, at 4 p.m. and 8 p.m. in the Glenn Memorial Auditorium. Established in 1935, the candlelit evening service features choral music and scripture with readings by special guests from the Emory community. Tickets are $20, $15 for discount categories and $5 for Emory students. Listen in wonder as Christmas with Atlanta Master Chorale brings a sense of peace and friendship through holiday music that connects past to present. Carols of the season ring out in the Emerson Concert Hall of the Schwartz Center for Performing Arts on Saturday, Dec. 9, at 8 p.m. General tickets are $35; $30 for discount categories and $10 for students. Old Saint Nick visits Emory to introduce some of his favorite classical works and give treats to good listeners for Santa’s Favorite Chamber Music, Sunday, Dec. 10, at 4 p.m. in the Michael C. Carlos Museum. This concert is a part of the Emory Chamber Music Society of Atlanta’s Family Series and is free and open to the public. The Oxford Chorale presents a concert of seasonal and holiday music Thursday, Nov. 30, and Friday, Dec. 1, in the chapel on the Oxford College campus. Directed by Maria Orchetto, performances take place at 8 p.m. both nights; tickets are $5 per person. Then on Saturday, Dec. 2, at 4 p.m. Meridian Herald presents its 24th annual Southern Folk Advent Service at Old Church near the Oxford campus. This year's service includes bluegrass-gospel music from Leah Calvert and Friends, reflections from Brooks Holifield of Emory’s Candler School of Theology, and Sacred Harp tunes from the Meridian Chorale and soloists, including Timothy Miller. Admission is free and no tickets are required. Finally, on Reading Day, Dec. 6, Volunteer Oxford will host a party where students will wrap presents provided by faculty and staff for children in the surrounding community. Planning a holiday event at Emory? Contact ltking@emory.edu for inclusion in Emory Report calendars.